When you're first diagnosed as having a chronic illness and you face the prospect of having to live your life counting spoons, you quickly realise that there are going to be some things that you just can't do no matter how much you want to. When you add in a job like being an indie author into the mix, you'll find yourself running into problems as you try to achieve all the things you need to do. What do you do when your career needs you to do something, but your body is saying "nope!"? The first thing to do is to face the fact that you will probably never go back to the person you were before you got sick, and realise that if you're going to accomplish things on both your good and bad days, you'll need to have some idea of just how far you can push yourself before it all comes back to bite you in the arse. For me, it was a big thing to accept that despite how much I wanted to take part in a blog tour or convention, I just couldn't do it all. I had to learn to listen to my body and I had to learn that I could say No. If you're anything like me, you'll know that saying No to someone can feel like a bad thing. It can feel like saying no is telling that person or that opportunity that you never want their help again. I know in reality it isn't like that, but it's taken me a long time to get to this point. Before, saying no just wasn't something I felt comfortable doing. It felt like I was being rude, like I wasn't grateful for the opportunity being offered to me. But of course, it's not that at all, it's about knowing that if I do this thing or this promotion or push myself to write those chapters, in a few hours I will pay for it dearly. My body will rebel and I will end up spending precious time either in bed, or worse, in hospital where I'm too unwell to do anything. The feeling of wasted time, for me at least, is worse than the feeling of saying no. So over the past few years, I have learnt that sometimes you just have to bite the bullet and tell someone that it was great to be thought of, but you just can't commit to that event. 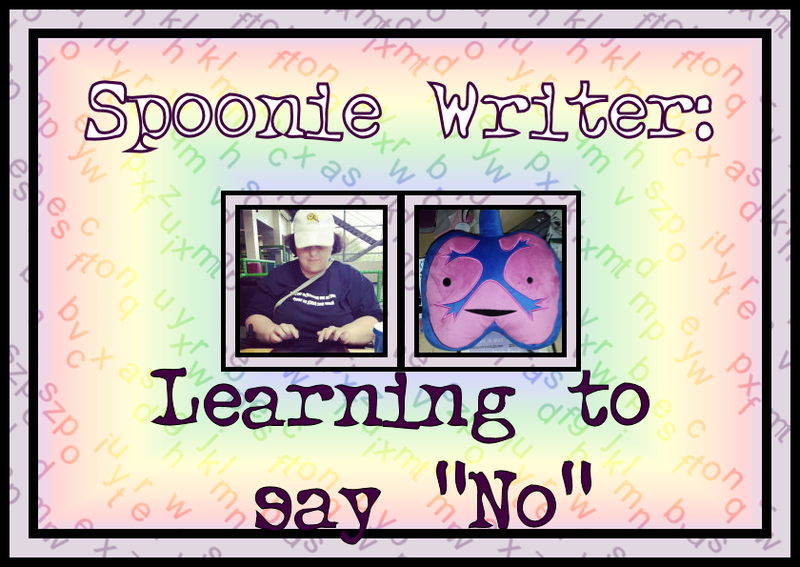 It's not a bad thing, it doesn't mean that you've let someone down and it's all part of being a spoonie. There will be some people who won't see it that way, and honestly, those people are not worth the worry and anxiety. Those who understand will see that you need to have time to rest, to take some time away and that you are unable to commit to something that may make your condition worse, cause a flare or land you in the hospital. No one else can tell you how you feel, it's your body and your conditions and you will get to know them oh-so-well, and it's about learning to read the signs and know that although you are desperate to do a book tour or a book signing or a guest blog, you just can't at that moment in time. As someone more insightful than me said, the people who matter won't mind and those who mind...they don't matter!